Assay Office of Estonia has exclusive rights for Hallmarking of precious metals in Estonia until 2015. (regulation of minister 10-0237). If precious metal article consists from some different parts, determination of each part’s fineness is held. The fineness of each part of the article must be corresponded to the fineness mark stamped to the article – the fineness of any used in the item alloy can not be lower than the fineness mark on the article. The mark ”met” shall be stamped to the item, if the precious metal content does not correspond to the lowest standard fineness for this precious metal. According to current legislation a precious metal article shall not be offered for sale or transferred for charge if it is coated with nickel. The precious metal articles coated with nickel aren’t hallmarked. The presence of nickel coat is determined by XRF-analysis. 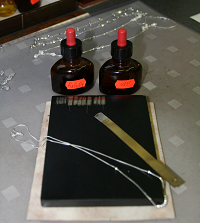 The precious metals article fineness testing to the standards fineness correspondence by touch-stone method. For the touch-stone testing the precious metals alloys with the standard fineness (standards) are used. The test alloy’s sample and near by it the standard alloy’s sample are made on the touch-stone. Then on the alloys samples is put a special chemical reagent. The traces of reagent’s action on the test alloy and standard alloy samples are compared and as the conclusion is testing alloy correspondence or non-correspondence to the standard fineness. If there isn’t appropriate (by alloy composition) standard alloy for testing, or during the testing appears that item fineness is lower than fineness was declared by item’s owner, the item XRF analysis is followed. If as result of x-ray analysis is the precious metal article’s to declared fineness non correspondence, the laboratory informs on it the article’s owner. At the coordination with the article’s owner there is the possibility to carry out the destructive method of the precious metal alloy analysis (in the case of the lot of articles). The results of destructives methods of analysis are decisive. is marked with mark „met”.